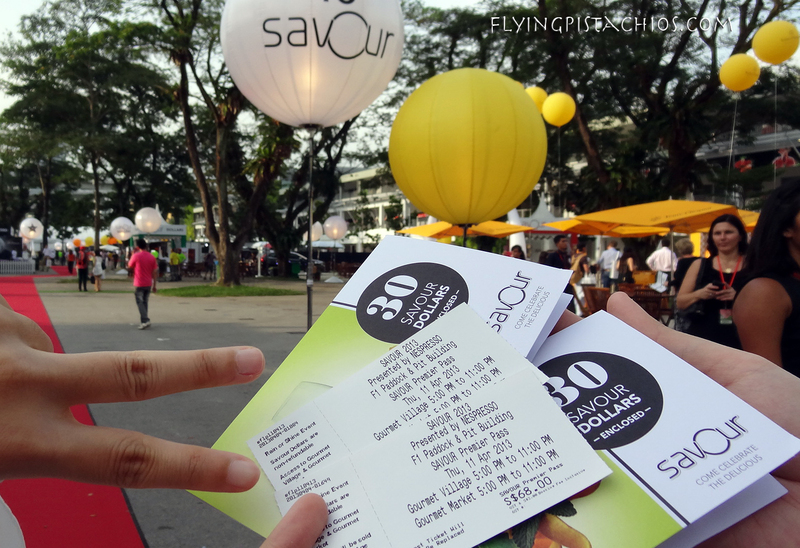 Heading to the Savour 2013 this weekend? Then you’re in for as awesome gastronomical delight! Jessica and I were there last evening on the Savour Premier Pass and the 5 hours time we were there was well spent. Probably the best night in the past few weeks! In case you’re wondering how’s it like, here’s a detailed description: It’s fine dining minus the perks of sitting comfortably in a (often too cold) restaurant being served by (hopefully) well trained waiters and waitresses. But wait, here’s all the benefits! 1) Perks of not having to be restraint by black tie dress codes and that literally breath-taking black dress. 2) You don’t need to worry about table manners and which utensils to start first, plus all the watchful eyes around the table scrutinizing your every bite, cause there is simply not enough time for all these. 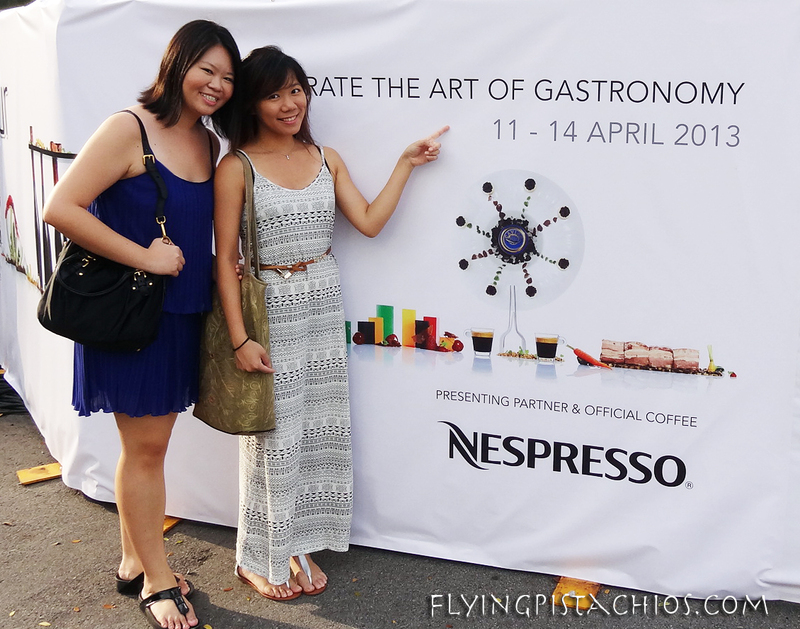 3) Run around, shout and gasp, make new friends and have tons of fun exploring food exploration. 4) Heck the 5-courses and 8 courses. It’s a FIFTY THREE 53 set course event. Just eat! You can see that I am overly biased here – but don’t judge too fast till you see the menu below. 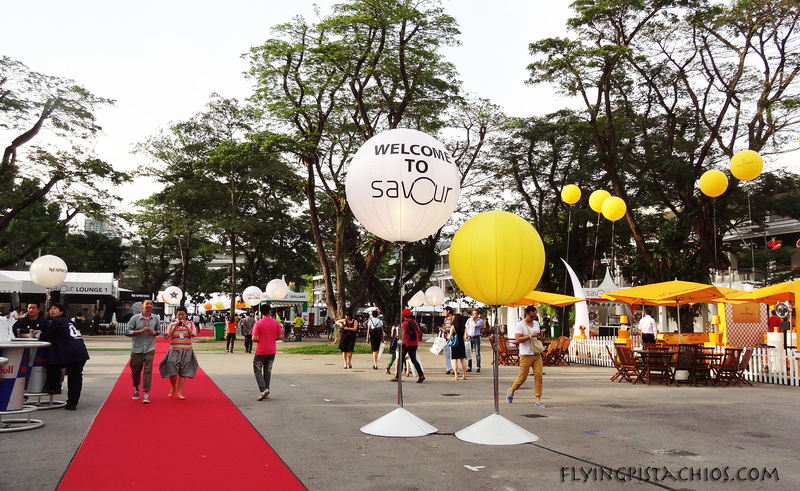 Savour 2013, located at the F1 Pit Building this year, covers 3 stories, with the first level covering the Gourmet Village and the 2nd & 3rd level the Gourmet Market. Shortly put, the PLACE IS HUGE. And depending on the type of ticket you’ve got, chances are you won’t have time to finish everything. In your goodie bag you will receive a Festival Guide and your Activity Schedule. The management didn’t provide the guides for nothing. * Note that there is a mistake in the Festive Guide. Alvin Leung’s Cha Chan Tang (Bo Innovation) is $8, not S10. 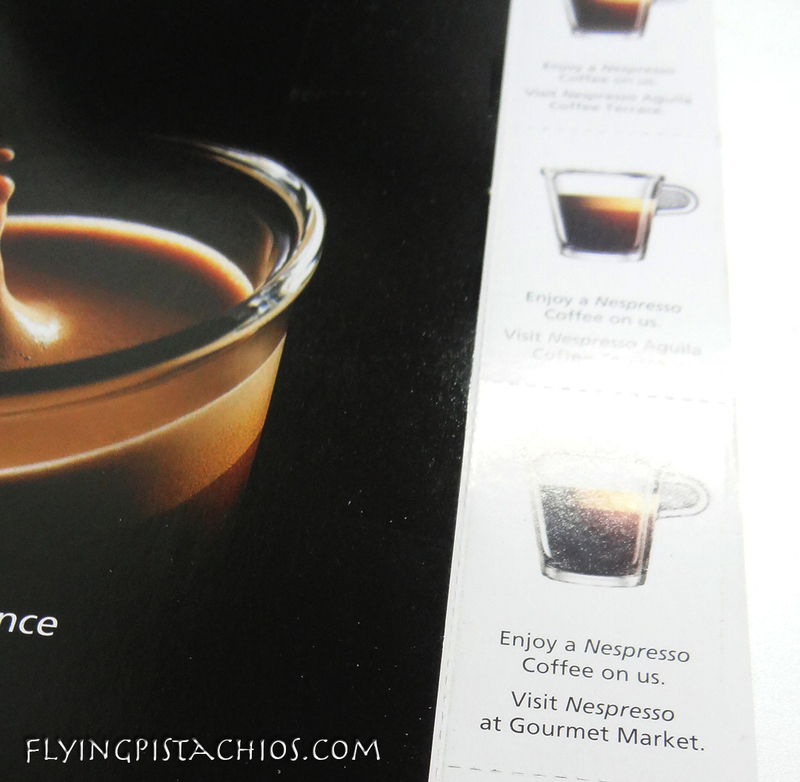 1) Get your free Nespresso Coffee first! 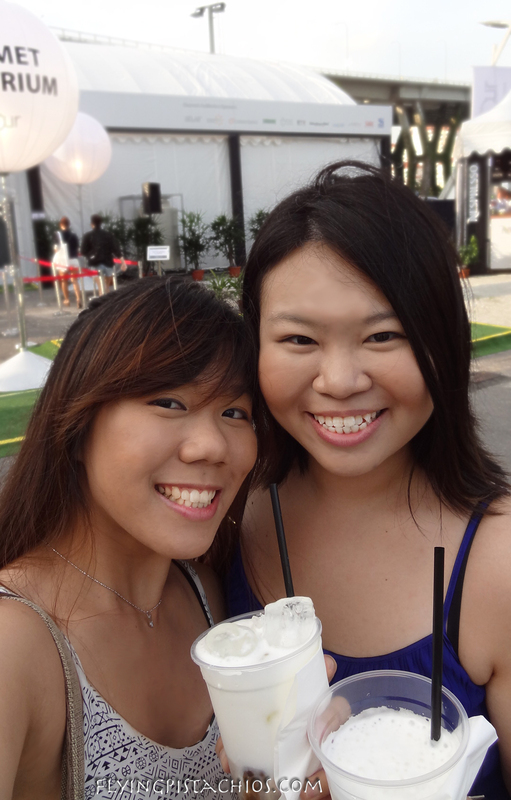 Whether you’re at Savour2013 for lunch or dinner, a great cup of iced-latte would make a good beginning to the food trail – Cools you down, perk you up! You’ll need lots of energy to scourer the 3 levels of delicacies, so do a good start! There’s 2 booths at level 1, so if the booth at the entrance is having a long queue, go to the one at the end near the auditorium. We did that and my take is you don’t have time to queue up and there’s no queue at the end. 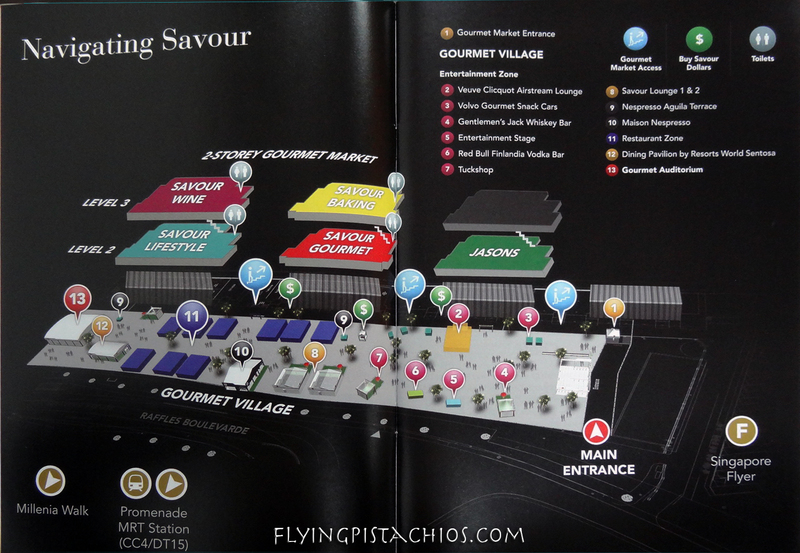 Use the walk to familiarise yourself with the Gourmet Village settings. With your Nespresso, take it easy and find a sit to plan your time. Frankly my camera shots of the Festival Guide does not do justice to the booklet. The pictures and better and clearer so please take a second look through! Circle those that you must try and box those that you can consider if you are going for a second round. 60 Savour Dollars to spend – Not enough! 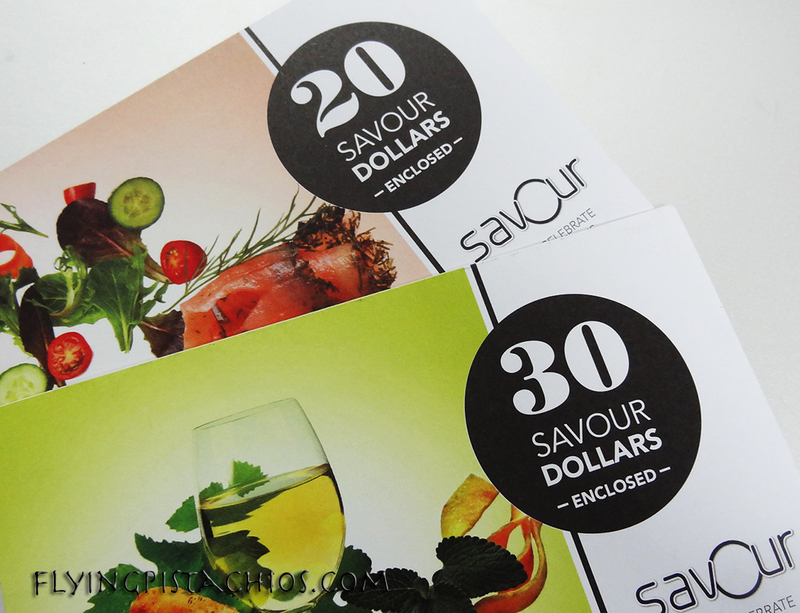 Your Savour Dollars comes in either packs of $20 or $30, so plan well! 4) Take lots of photos! Queue up, get your food, and don’t be PaiSeh la….- take lots of pictures cause everyone’s doing the same too! It’s going to be the only thing that’s left from the food… so remember to take each and every one dish before you tuck in. The first dish was simply amazing. As a typical Singaporean, I love Chicken Rice to bits and as long as the chicken’s a plenty, it’s a dish that can never go wrong. Never once in my life did I expect to be ordering Chicken Rice, without the chicken. And here’s it, NO chicken. 3 times smaller than the average size I can get at 3 times less the price some-more. But don’t get me wrong here. The chicken flavour in the rice is so fragrant and powerful, adding any meat into it would be an ‘extra’. Jessica suspects the rice used is the same as type used to make Risotto, thus it readily absorbs the flavour, dispersing it into your mouth with every spoon. 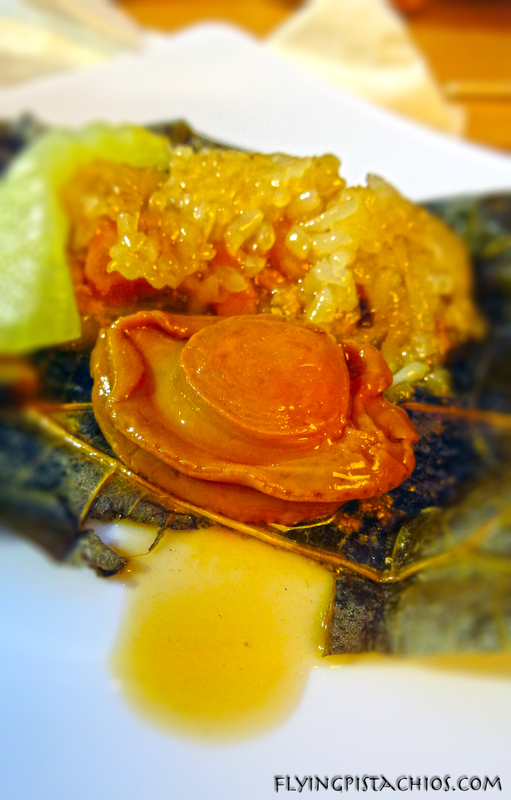 The rice was perfectly cooked too – soft but still able to see and feel individual grains. 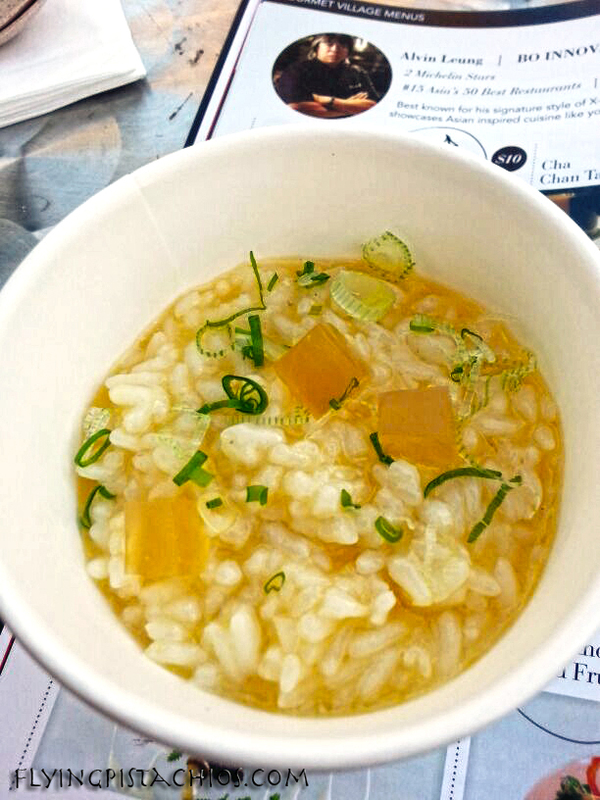 Like Risotto, the secret is in the sauce and the Abalone Jelly completed the overall aesthetics. With the different tasty and luxurious seafood infused into a single dish, what’s left is only the Chef’s cooking skills to set it into perfection. The scallop was freshly picked with it’s top quickly roasted and it’s middle so soft and fresh, it slightly melts on your tongue. 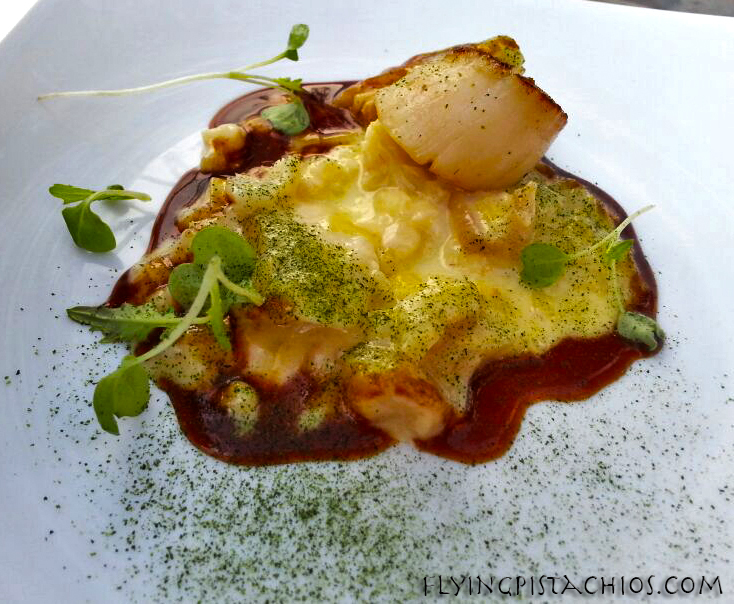 There were bite pieces of Cod Brandade that only made you think more of the scallop 😛 If you are a seafood lover, then go for this fusion. You’ll love the experience. 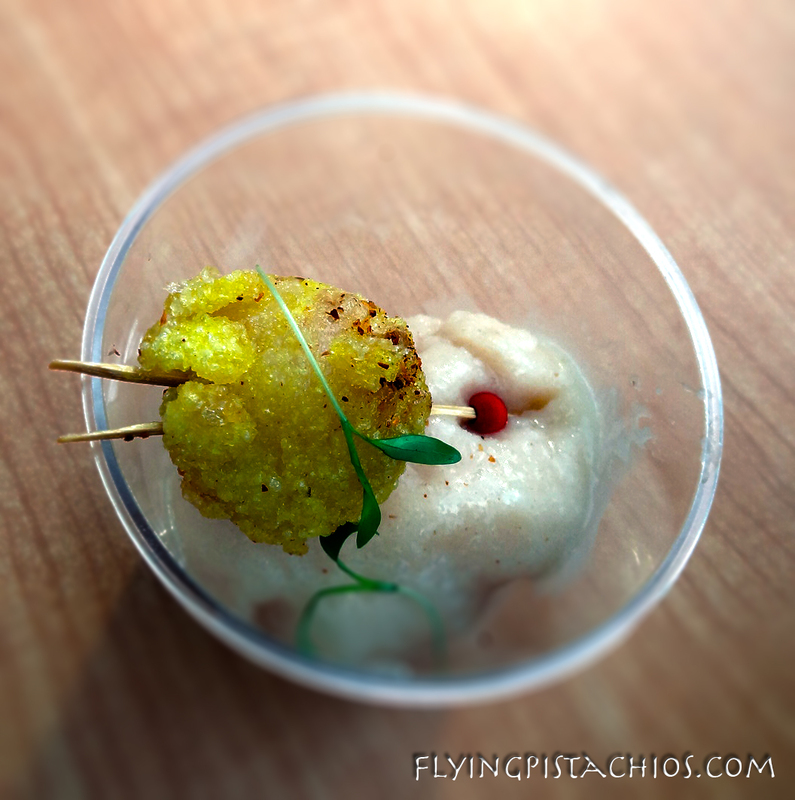 It took me and Jessica awhile to figure out how to eat this – Should the lightly Fried King Crab be savoured together, or separately from the Frozen Lychee Martini? In the end, we let the dish decide by itself. As we are 2 hungry girls, we tried splitting the ball of King Crab into half, but it went deep into the Frozen Lychee Martini instead and we ended up mixing it together. I am glad we did that, as the first word that came out of my mouth after the death of the dish was ‘ Ingenious!’ Who would have thought that Cold Lychee flavour would go with so well with the warm Crab meat (Douglas did…)? It’s a unusual pairing, top it up with the Cold and Warm sensation on your tongue at the same time, the dish deserves its score. I’ll pay to go in once again for this dish! If you realise, there’s no picture of this dish on the guide booklet, that’s because Jason Atherton didn’t manage to submit the images in time to make it for the print! But, that said, the queue for Pollen Street Social is always long – Is this convincing enough? We got to know about this dish from another lady who was sharing the same table as us. It wasn’t on our circled list as there’s no picture, but she raved about it we thought it’s worth it to trust WOM. So we went, and the standing tables around the store was filled….! Lots and lots of precious Crab Meat shreds hidden in between and boy, the meat went so perfectly with the fruits & corn flavor, it’s to die for! I love love love the creamy feel of the whole dish and even towards the end when the flavors were mixed, they blended well like a best-seller smoothie. 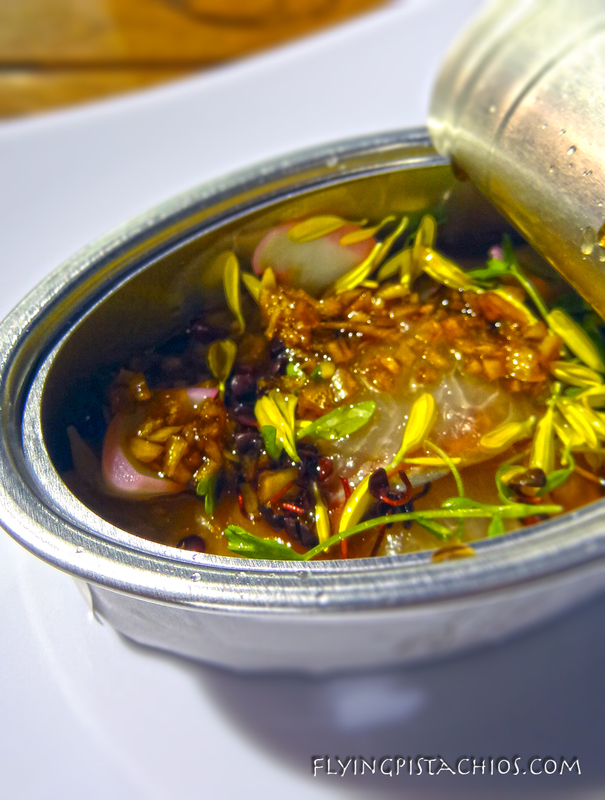 Every scoop was full of crab meat, it’s a wonder how Jason Atherton packed all the flavors and so much crab meat into that little square cup…. 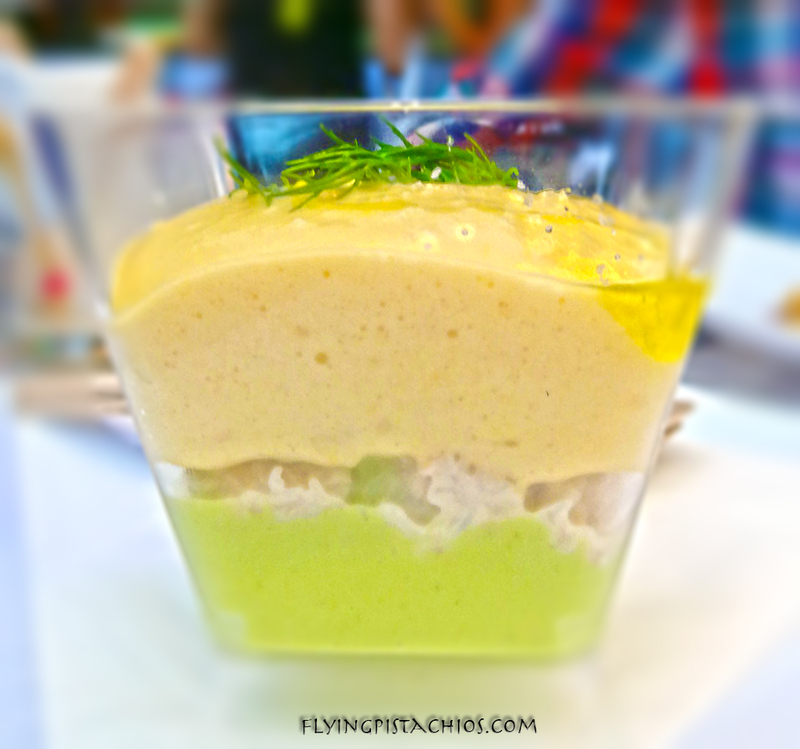 Everything from the refreshing Lemon Mayonaise, the creamy delightful Avocado Puree, the nice and sweet corn bits moving apart to reveal the succulent fresh crab meat was perfectly matched, perfectly layered and perfectly portioned. It’s a MUST TRY. 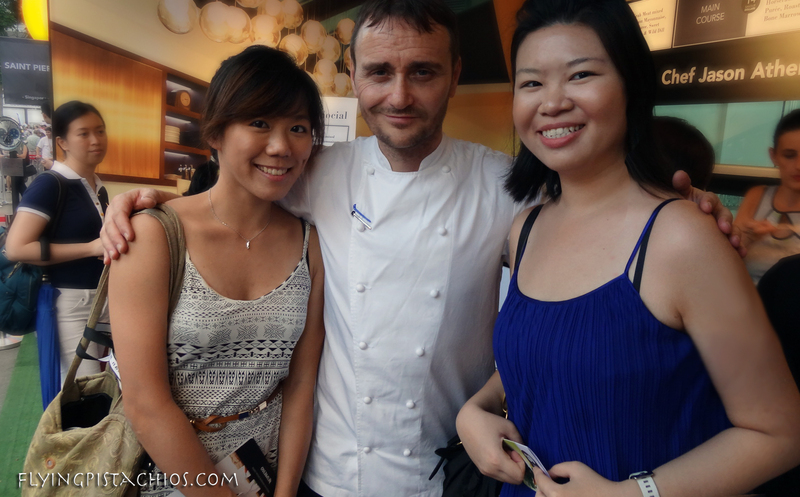 A photo with Jason Atherton! I am not going to talk much about this dish here as it’s such a disappointment. If you think $18 is a good steal for a nice piece of Baby Abalone that taste like those from the can, go for it. It’s nice. But that’s about it. If not, good, your Savour Credit can be better spent elsewhere. I’ve never really realized the smell and taste of truffles until Jessica formally introduced it to me (she’s the foodie here >.<) . It took me afew deep whiffs to smell it’s strikingly unique smell. It’s not the dish’s fault, Jessica detected the smell when we were several stalls aways. I probably smell with my tongue only. And when the raw Yellowtail touches the tongue, I can see why it can be addictive. It’s basically a awesome tasting Chawanmushi. 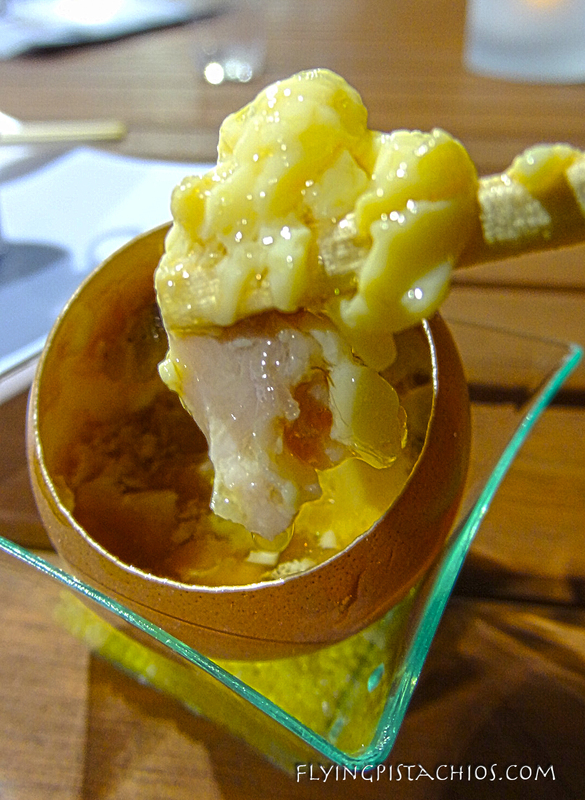 Not meaning to under-rate the dish, but other than the intricate cooking and serving method (in a fragile little eggshell), there’s no special fusion – Just your good old Chawanmushi specially concocted by your famous chef making it taste so awesome a Egg lover like me might want to go for more. 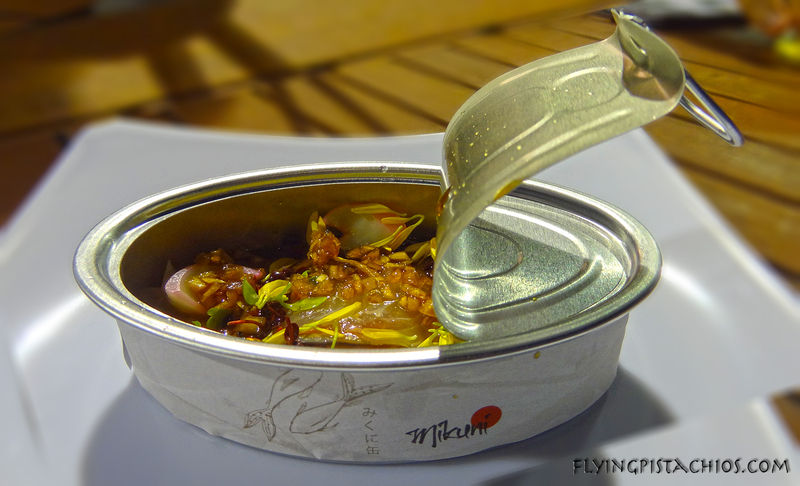 Try it if you are a Chawanmushi lover and don’t want to miss the possibly best tasting Chawanmushi on Earth. Otherwise, go for something else, like the next one below! It’s no wonder why Douglas Tay’s on the first page of the the stalls feature! 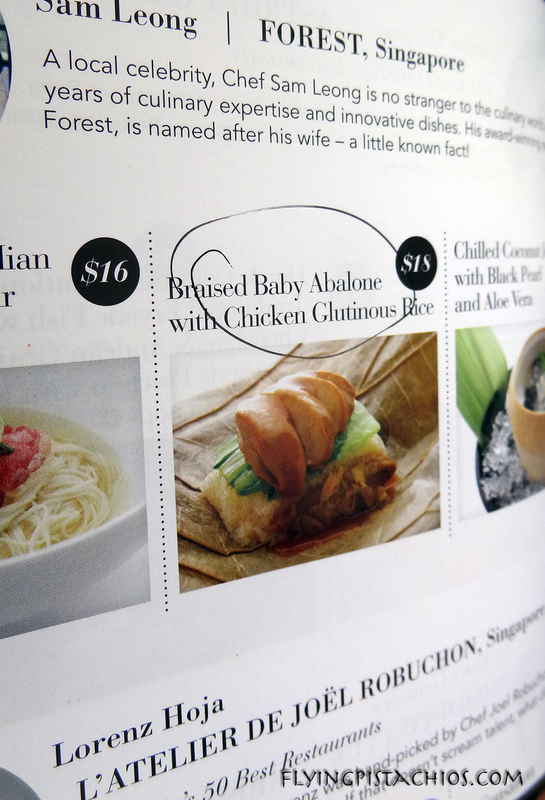 Because the first 2 dishes we tried were good, we decided to pick another one of his 5 Savour 2013 dishes for savoring. Boy am I glad I’ve got Jessica who choose this pretty little tasty thing with the last $8 Savour Dollars we’ve left from the first round. Frankly, they should use my picture here for their promotional collateral. I’m calling this dish: Growing up. The little colorful sweets on the warmed banana were really nice and made us happy little kids. Then we finished the sweets and grew up a little, deciding to go for a ‘healthier choice’ and began picking the banana. Then we became adults, well roasted by society, strong, crispy and full of favour (the biscotti). Not long later, we hit mid-life and needed some coffee to maintain the energy, good tasting one here to ‘perk-me-up’. At the end, after having lived life to the fullest, it’s time to relax and enjoy, sitting back and having a little bit of Chocolate Milk Tea (while having fun defying the doctor’s letter). 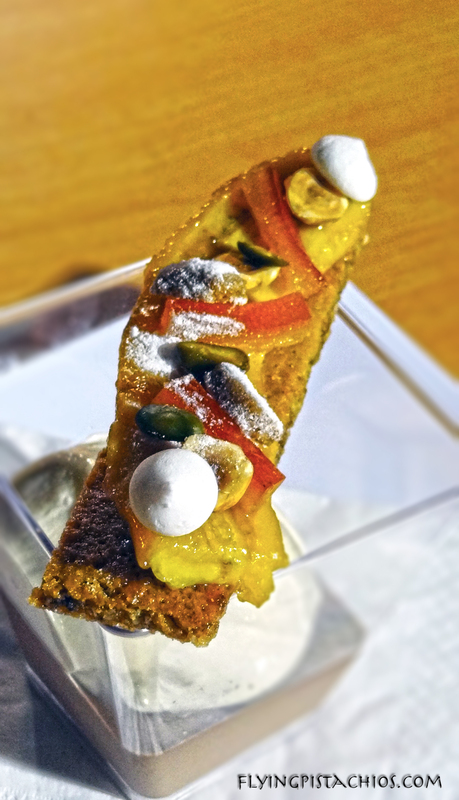 Try dipping the biscotti into the Coffee Espuma. 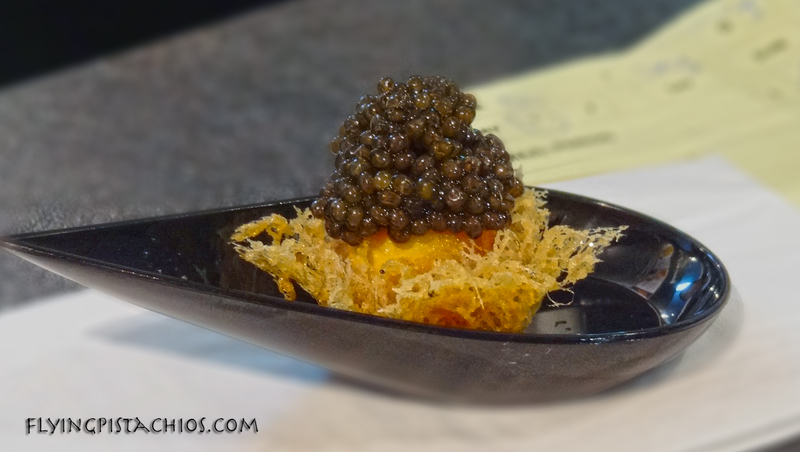 It goes really well with the Espuma melting in your mouth as your teeth prepares to crack that crispy one. Margot Janse made this dish and I am so proud of her. She’s the only female chef for the whole event, which means she must be really good at what she does. 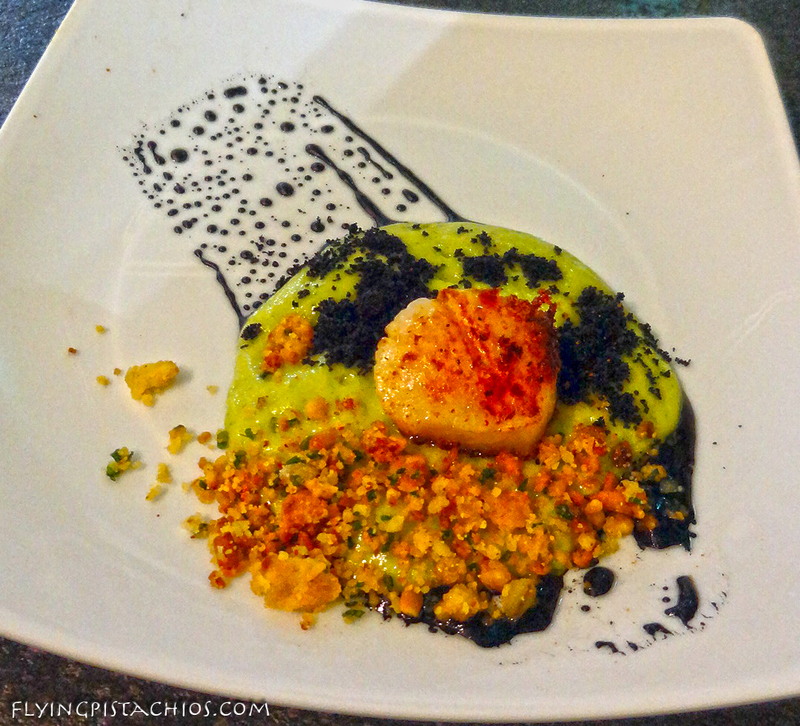 Maybe I had too high an expectation for this dish, it didn’t really impress me, but it was good tasting like how lightly roasted Scallops should – melting in the mouth alittle. 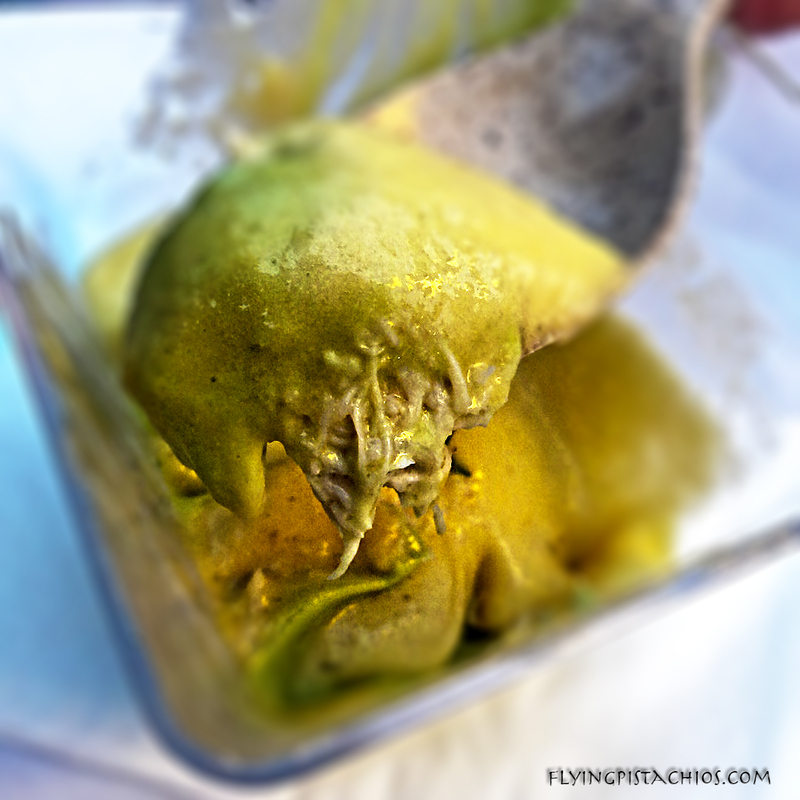 The whole trouble is her ingredients are so special and unheard of – Dill Vichysoisse? Google couldn’t even recognize the name, giving me Dill Vichyssoise instead (sarcasm mildly intended) . Apparently it’s leek and potato. In anyway, although I (really did) celebrate her victory with Margot Janse, perhaps you should try her Beetroot Sponge, Wild Rice and Macadamia Salad, Baobab Yogurt instead. It’s the same amount of savour dollars and I saw quite afew people enjoying that. Let me know how it is if you have tried it. And finally, the one that stunned us, for the wrong reason. Firstly, we should have came here first so that we can realize that this dish is $8 instead of $10 so that we have $12 to spend it on something (I have forgotten which dish that was) that Jess wanted to try. We didn’t, so we still have that depressing $2 Savour Dollar with us. Then, right after I had tasted the Kaya Marshmellow and was going to tell her that it tasted like sweets, Jessica dropped hers on the ground. We both petrified instantly. It was like a horror movie you wished you’ve never watched. Reminder: Guard your food carefully and make sure it reaches your mouth safely. 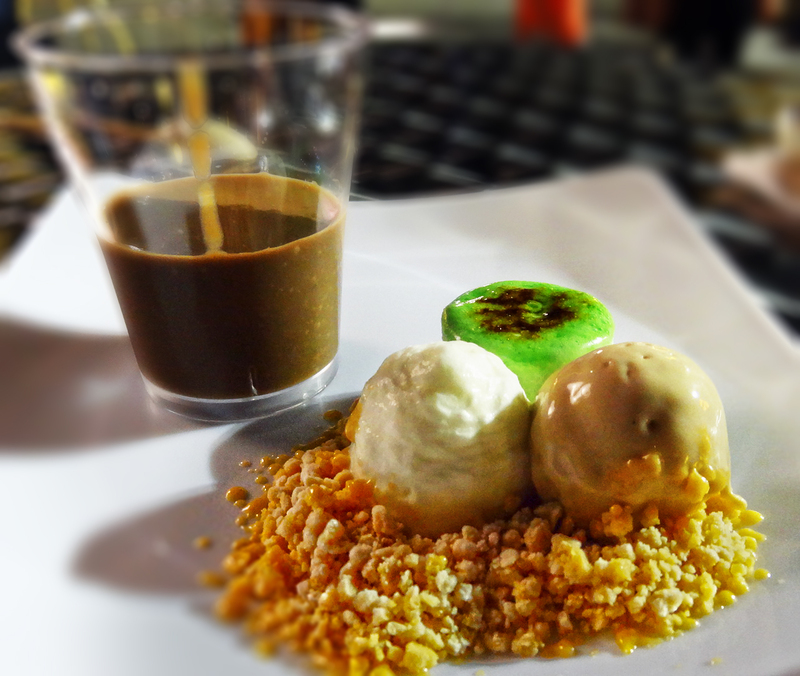 The star of this 4 dessert dish is probably the “Ying Yang” Hot Milk Tea and Cold Coffee where the cup is first carefully divided into 2 by a sheet of plastic before pouring in the Hot Milk Tea on one side and the Cold Coffee on the other. Then, the sheet is carefully removed and the Milk Tea stays on its side with the Coffee staying on the other side (see how the liquid in the cup has 2 colors). I didn’t realize this and foolishly dipped my spoon into the cup for a sip, thus what I got was a warm Ying Yang. But if you do try this, drink from the cup and you’ll get the special hot and cold sensation rushing into your mouth and down your throat. 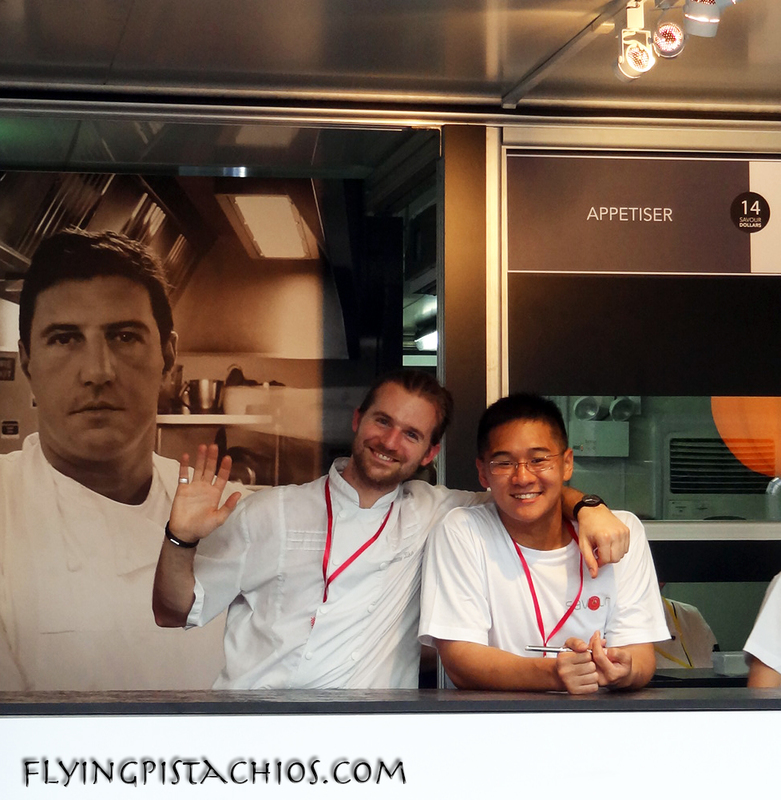 5) Make friends – With the Chefs! Well, they designed and cooked your food so give them some credit! 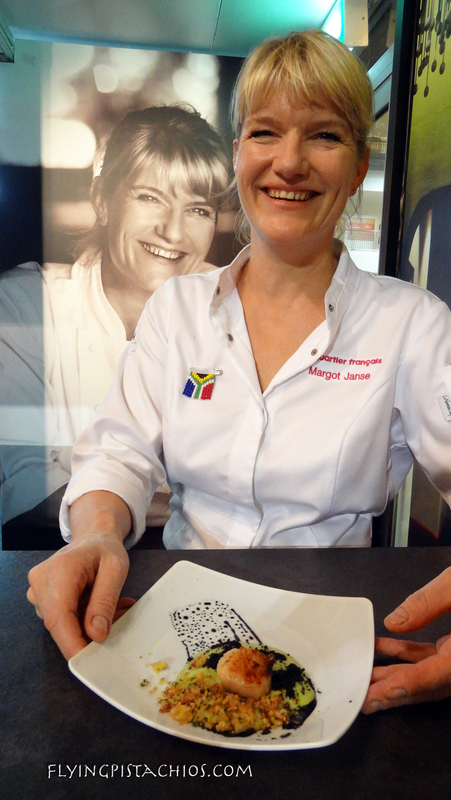 Margot Janse holding the dish that was served to us 😀 She’s the women’s pride! There’s also lots of ridiculously good looking assistant Chefs, don’t forget to take them too! 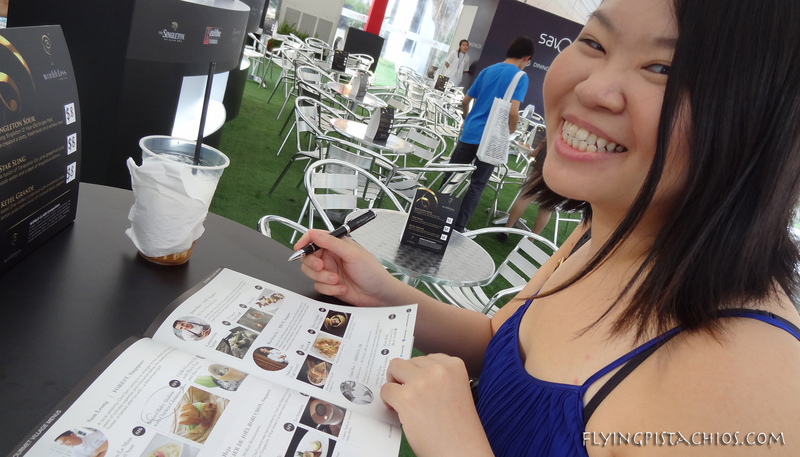 Finally, here’s the last tip for Savour 2013. Timing. As we had the Thursday’s tickets that gave us only 6 hours in the venue, plus the yaya mistake that we were an hour late, we had only 5 hours to complete everything. it may seem like alot of time, but frankly, there isn’t. We had planned to run for some of the classes, but the food at Gourment Village was too good to leave. But neither of us regretted the decision. With your weekend pass, you get more hours at the Gourmet Market and liited time at the Gourmet Village. It’s not going to be any better than Thursday as its the weekends and there’s bound to be disgusting queues. My take is that you should simply spend all the time you have in the Gourmet Village in the Village itself and finish tasting all the dishes that you know you’ld regret not trying. Then you start looking into your workshop schedules to see which are the classes you can go with the rest of the time. It makes no sense walking up 3 levels and coming down again to attend a class. The F1 Pit Building is a huge place and all the walking would take away the precious time that could mean 1 dish less to try. Then, in between your selected class schedule time slots, visit the Gourmet Market here and there in pockets. You’ll probably need at most 2 hours to complete the whole Gourmet Market and even 1 hour if you proceed selectively. Example, find out which are the stalls that do not have a Shop in Singapore and pay special attention to them. 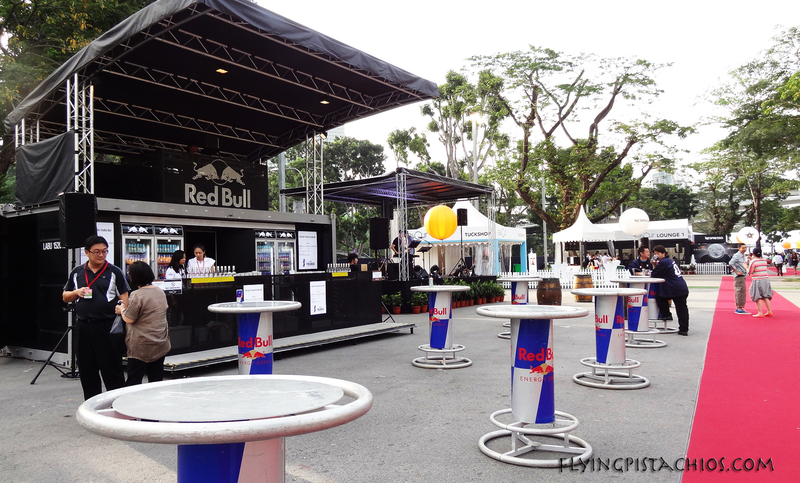 For the rest, if they have a stall in SG, you can always patronize them after the event. I hope that this guide will be helpful to any friends heading to Savour this weekend! With this, I’ll end off here. Have fun!